We start with a segment arr[0 . . . n-1]. and every time we divide the current segment into two halves(if it has not yet become a segment of length 1), and then call the same procedure on both halves, and for each such segment we store the sum in corresponding node. All levels of the constructed segment tree will be completely filled except the last level. Also, the tree will be a Full Binary Tree because we always divide segments in two halves at every level. Since the constructed tree is always full binary tree with n leaves, there will be n-1 internal nodes. So total number of nodes will be 2n – 1. Height of the segment tree will be ceil[log(n)]. Since the tree is represented using array and relation between parent and child indexes must be maintained, size of memory allocated for segment tree will be 2*2 ^(ceil(log(n))) - 1. How is the memory allocated(last line of the above para) that much? How are the parent and child indexes stored in the code if it is correct? Please give reasoning behind this. If this is false then what is the correct value? What is happening here is, if you have an array of n elements, then the segment tree will have a leaf node for each of these n entries. Thus, we have (n) leaf nodes, and also (n-1) internal nodes. Total no. of nodes = 2^0 + 2^1 + 2^2 + … + 2^ceil(Log2(n)) // which is a geometric progression where 2^i denotes, the number of nodes at level i. = 2* [2^ceil(Log2(n))] -1 (you need space in the array for each of the internal as well as leaf nodes which are this count in number), thus it is the array of size. = O(4 * n) approx.. If the above is you segment tree, then you array of segment tree will be: 10,3,7,1,2,3,4 i.e. 0th element will store the sum of 1st and 2nd entries, 1st entry will store the sum of 3 and 4th and 2nd will store the sum of 5th and 6th entry!! Oddly enough, I was reading from the same source as the question when I came upon this. I'll try and answer my best. The almost "Worst Case" scenario. This one is not completely balanced and not really fun to traverse. Why? Because, with different inputs, different trees might be generated and hence time taken to traverse is not very predictable. Our "Best Case" scenario. This one is totally balanced or complete and will take a predictable amount of time to traverse, always. Moreover, this tree is also better "hacked". Now let's get back to our question. [Refer to the first image] We know that for every n-input array (The numbers in green), there will be n-1 internal nodes (The numbers in blue). So a maximum of 2n-1 node space must be allocated. But the code here does something on the contrary. Why and how? Assuming the rest of the code works well, this is isn't a very good idea. That's because it creates our unbalanced tree, much like in our first case. Such a tree is not easy to traverse nor easy to apply to problem-solving. 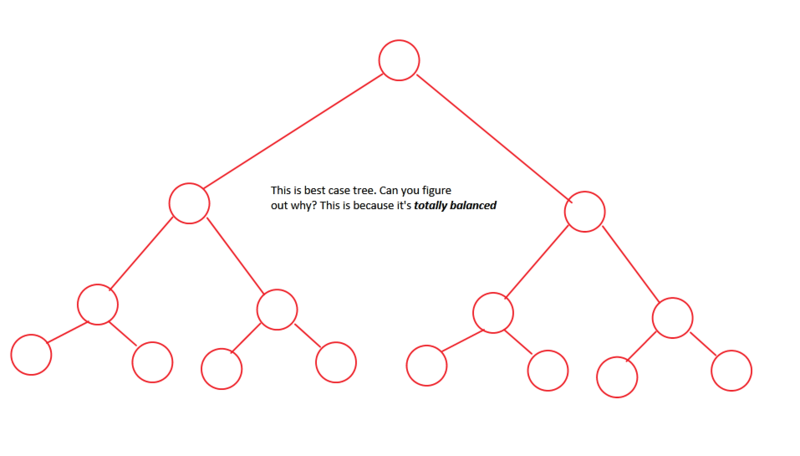 That is we allocate enough space to generate a balanced complete tree. Such a tree is easy to traverse (using some special modifications) and can be applied to problems directly. n numbers from our input array. n-1 internal nodes which are mandatorily required. The extra space we need to allocate for our padding. Greater than or equal to n (Number of elements in our input array). Is perfectly and repeatedly divisible by 2, to get a completely balanced 2-ary (binary) tree. Let the size of input array is n.
Not the answer you're looking for? Browse other questions tagged arrays memory data-structures tree segment-tree or ask your own question. Difference between “Complete binary tree”, “strict binary tree”,“full binary Tree”?